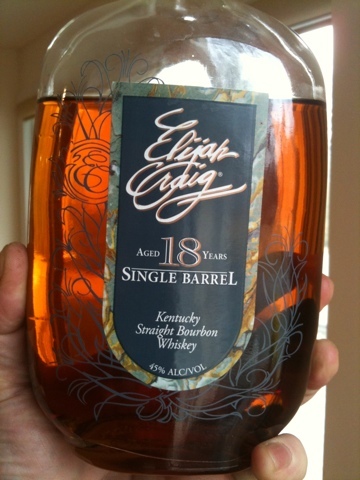 Elijah Craig 18 is, in my opinion, one of the finest bourbons available. Single barrel, unadulterated, unmessed with and aged into a rich indulgent woodiness - this is the real deal; an American classic. It comes from a low rye corn heavy mash bill; the same as used in Evan Williams black label and a number of other Heaven Hill products. However extensive aging and barrel selection has allowed this EC18 to rise to the top like cream. It tastes like a whole different animal. In the glass - a dark dark amber with a gleaming copper core. The nose is rich with toffee / butterscotch, oak, caramel corn, vanilla perfume, sherry, and cognac. Let it sit for 10-20 minutes to bloom before sipping. More aromas keep coming out and the sweetness is amplified in the taste. On entry there is sweetness: red and yellow fruits, maybe even some tropical fruits from the papaya and pineapple end of the spectrum, leather, floral vanilla and burnt caramel. By midpalate a dryness has crept in fueled by wood tannins. The oak is in the vanilla notes and also a perfume of sandalwood that emerges into the finish. The finish is looong and huge with leather, burnt caramel again, vanilla and sandalwood perfume. There's a rich heaviness to the mouth feel. The mix of sweet and dry is sophisticated and luscious. The whole affair is loaded, like a dense tropical rainforest. But the flavors are very accessible and the overall feel is sweet and easy; an aspect to which I credit the high corn mash bill. This is amazing bourbon and a steal at the price. My advice: never mix this. Never put water or ice in it. Let it air and sip it neat and slow. Time is this bourbon's friend. Time in the barrel, time in the glass. I find that I keep coming back to it over time too. It's a sinful guilty pleasure that hits all my bourbon buttons. You might not impress bourbon snobs by serving it, but you might find that you can convert people who don't drink bourbon with it. It's an undeniably higher quality class of liquor. Factor in price and it's one of the strongest cases out there.